The Rule of Law in Armed Conflicts (RULAC) project, which was initiated on 1 May 2007, is a global database dealing with the implementation of international law in situations of international and non-international armed conflict.  It is an initiative of the Geneva Academy of International Humanitarian Law and Human Rights. In reporting on every State and certain territories, it considers both the legal norms that apply as well as the extent to which they are respected by the relevant actors. It is the only website that systematically qualifies situations of armed violence in accordance with the definition of armed conflict under international humanitarian law. It also reports on, and analyses, relevant national, regional, and international case-law. The research is conducted by Dr. Sharon Weill and Silvia Suteu under the supervision of Dr. Stuart Casey-Maslen. The database was established thanks to support from the Swiss Federal Department of Foreign Affairs and the Government of Sweden, and has also received significant support from the Governments of Denmark and the United Kingdom. Switzerland continues to fund the project. The RULAC Project is independent and apolitical. As set out in the disclaimer for this website, there is no intent to imply the expression of an opinion on the part of the RULAC Project concerning the legal status of any country, territory, city or area, of its authorities, or the delimitation of frontiers or boundaries. The RULAC Project uses as its list of states those able to formally adhere to United Nations treaties. As of June 2012, there were 196 states: 193 UN member states and three others (the Cook Islands, the Holy See, and Niue).